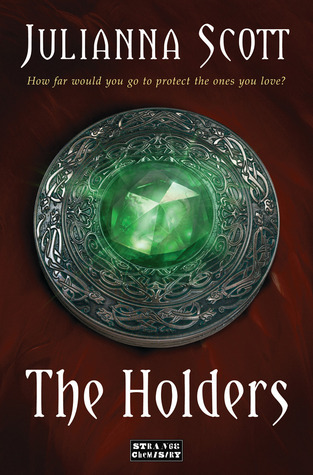 Thanks to author Julianna Scott for inviting Short & Sweet Reviews to be a part of her blog tour for her new book, The Holders! Keep reading to check out our review, and make sure you enter Julianna's contest to win a copy of the book and some amazing swag! This book had lots of opportunities to go wrong for me. Regular readers know that one thing that will make me not like a book is poor handling of mental illness, which is what I initially thought was happening at the beginning of the book, when Becca rails against all the people who want to treat Ryland, who hears voices. She sticks up for him, which is admirable, but at the same time, she also sends away anyone who wants to try to help. I was worried that the book was going to take a serious turn into NOPE NOPE NOPE-ville for me, but fortunately that wasn't the case. The relationship between Alex and Becca. Alex is a nice, sweet, caring guy. No more of this Bad Boy nonsense, Alex is the guy you'd take home to mom and who all of your friends would coo over. If there's a "favorite book boyfriends" question in the Best of 2013 meme at the end of the year, you can bet Alex will most likely be on it. I like the fact that Becca doesn't go from zero to "I can't live without you" upon meeting him. She develops a perfectly normal crush on him, one she spends a lot of time trying to ignore. (Obviously, that doesn't work.) There are some other aspects of their relationship that I'd LOVE to talk about more but they're spoilers. Becca's anger at her father Jocelyn, and her over-protectiveness of her brother. It's interesting to watch how both of these things grow and change and mature over the course of the book. The book is very fast paced and is a quick read. I found myself staying up WAY past my bedtime to finish reading it, because I wanted to know how things end. Becca is a great leading character -- she experiences conflict, she is passionate about things, she has opinions, and she's just starting to try to find herself now after she realizes that she doesn't have to live her life solely for her brother anymore. She's a bit of a tough nut to crack, as she's spent her whole life having to be strong for her brother and mother, so the times when she does allow herself to get close to someone, or express her real emotions, are pretty poignant. Also, I loved watching Ryland grow and blossom during his time at St. Brigid's - it will be interesting to see how he keeps growing into his abilities, now that he's finally somewhere that he fits in. Almost everything is super predictable. I guessed two of the major plot points way before we ever got there in the book. Now, I'm not the most observant reader, I prefer to not try to guess at future developments while reading. So if I guess something quickly and early on, that means it's way obvious, which could be frustrating for readers who are pros at guessing plots. A lot of the characters are very one-note. There's the bubbly new best friend, the wise older woman, the funny/quirky bickering sidekick-types, the gruff and unreasonably angry guy, etc. Most of their personalities don't get fleshed out much more than that in this book - I was really hoping for something unexpected where the villain would be someone you didn't expect, but not so much. There is SO much telling rather than showing. SO MUCH. It's inevitable, in some ways, as Becca and Ryland are new to this whole universe of Holders so they need to have a lot explained to them, but I found the long info dumps to be the places where I wanted to start skimming, which is bad, because it's all info I probably need to know as a reader in the first place. Sometimes it feels like not a lot happens - like this book is the requisite establish-the-universe book for a future series. It probably doesn't stand on its own very well, as it asks a lot of questions which don't get answered. Overall, I enjoyed reading this book and will be checking out future books in the series. It is a mostly clean read, with some profanity, violence, and kissing scenes. Interested in reading the book and winning a lot of great prizes? Then enter the giveaway generously offered by Julianna - open to addresses in the US and Canada. Thank you for the Giveaway. I think this book looks really good. It's on my Amazon wishlist already, lol. I read this book a couple of months ago and you hit the nail on the head with every aspect. The ONLY thing that bothered me about this book was that I wanted to know more about the characters. I felt like I didn't know them enough. Same here! I'm guessing it's because it's (hopefully) the first book in a series, so maybe we will learn more about them in future books? I'm hoping so at least, because I felt like they could all be fleshed out a little more.